Building a mosaic shower stall offers many advantages: unlimited choice of colors, long lasting materials, not to mention easy maintenance and the fact that ceramic makes your bathroom look more attractive. Making a tile shower can be a very large project on its own. So making a mosaic shower is even more work. However taken step by step and broken down piece by piece this can be a very reachable project for any beginner in the mosaic field. In this page I will not go in details for the preparations needed to make a tile shower but I will give you the basics. First, always start with the framework and plumbing. Make certain you have enough studs and a good nailing strip to fix the water-resistant concrete panels to the framing. I recommend 12 inches apart center to center and insolate between your studs for sound proofing. Second, use galvanized, stainless steel or aluminum screws to secure you cement backer-board to your studs. Third, cover all joints with a fibreglass mesh joint tape and apply a generous amount of polymer glue to joints and corners. Fourth, pour cement for the floor making sure the slope to the drain is at least 1/4 inch per foot. Then install your membrane on the floor. 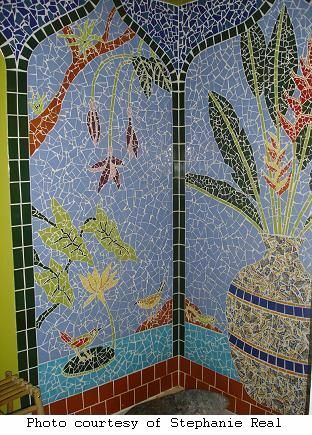 Mosaics used in showers can be anything from just a nice border around, to a complete nature scene on all walls just like this beautiful shower stall you see here. The key is to divide your work into small sections. A good size to work with is about 12 by 12 inches. Use the direct method with fibreglass mesh. If your mosaic does not cover the entire area of your shower walls I recommend installing the regular tiles first, leaving unfinished the sections where your mosaic will be. The key here is to carefully plan your tile work. Measure and mark the location where the tile wall is to end and always start laying the tiles from the bottom and at the junction of two walls. Trace guide lines with a chalk line; your work will be straighter if you rely on those markers. Once all this is done you are ready to install your mosaic. You can get many patterns from the small patterns page, or the mosaic border patterns page or make your own personal mosaic art pattern. Lastly you will need to seal your grout line and tiles if you used natural materials such as marble, granite or mosaic pebble tiles. If you have any questions about making mosaics or you would like more details go see the mosaic questions page or contact us. You can also find more great information about shower stalls from different styles to bases to types of glass doors.